Our deal hunting editors have aimed at South America this time, so thanks to them you can fly to Asuncion with Delta under $1,000 r/t, with taxes. Depart from San Francisco this May and get cheap Paraguay airfares from $955 – much cheaper than any other airline on this route. This Asuncion flight provided by our partner, Faredepot was found by our editors on Travelgrove. You can find it there yourself, but do not forget to search other providers too in order to make sure that you booked the best deal possible. Start your trip to Asuncion from San Francisco International Airport (IATA code: SFO) on May 15 and fly back from Silvio Pettirossi International Airport (ASU) on May 22. 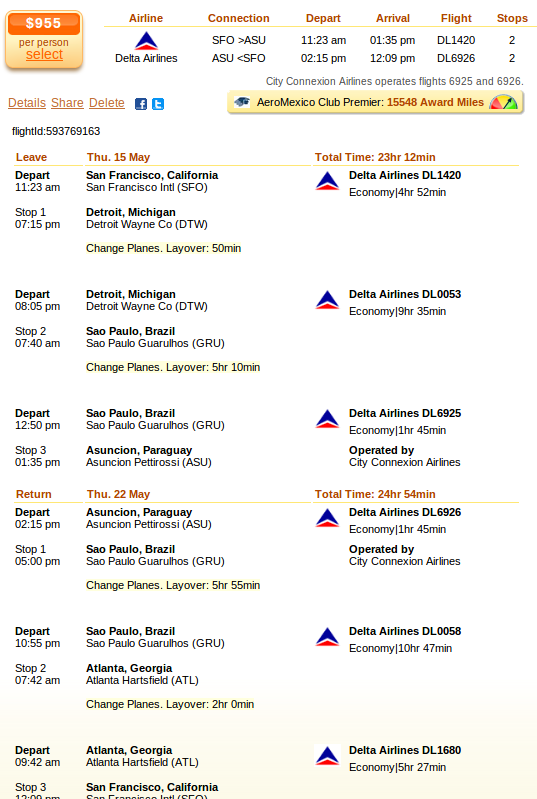 The departing flight has got one 50 minutes stop in Detroit and a 5 hours 10 minutes stop in Sao Paulo. The return flight first stops in Sao Paulo for 5 hours 55 minutes and then once again in Atlanta for 2 hours. With such a long haul flight you will earn 15,548 award miles from the AeroMexico Club Premier frequent flyer program. This amount is about 33% of a free flight between Mexico and the US. Delta definitely has got the best offer for $955, followed by a multiple airlines flight jointly operated by Delta, TAM and City Connections Airlines that costs $1,041 r/t. It is nearly $90 more than the Delta offer, jut think about it, you can use that money to go to a nice restaurant or for shopping. This entry was posted on Wednesday, April 30th, 2014 at 6:03 am and is filed under Airfare Deals. You can follow any responses to this entry through the RSS 2.0 feed. You can leave a response, or trackback from your own site.